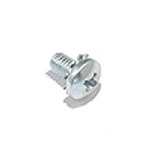 Short Phillips-head screw with built-in external star/lock washer (SEMS screw). #8 diameter, 32 threads per inch. Used for coil stop mounting on some Bally and Stern solid-state games, coin door hardware mounting, etc. Replaces Bally/Williams # 4008-01017-04 and Data East/Sega/Stern # 232-5300-00.